Save the date: November 13, 2011. For 2011 we have altered the format of our annual anniversary event. In years past it had grown to be quite the undertaking, with lots of festival activities, vendors, a poker ride, even a cyclocross race. Although fun for attendees and a great success, our volunteer coordinators and support staff got pretty burned out, despite the many accolades received from appreciative participants. The bottom line is to raise money for our programs while having fun celebrating our great trails and advocacy efforts. So this year we decided to keep it simple and do what we love best–RIDE! We are excited to be back at Malibu Creek State Park in Calabasas. The main ride route will feature the Crags Road Trail through the creek canyon, past the M*A*S*H site, and up Bulldog Motorway, and will also connect to National Park Service property at the Solstice Canyon section of the Backbone Trail with an optional out-and-back to Kanan Dume Road at Tunnel #1. It will continue along Mesa Peak Motoryway (the downhill last third is AKA Tapia Mtwy), finishing by coming back into Malibu Creek State Park via the Tapia Spur Trail. With the out-and-back to Kanan Dume Road the ride is 27 miles, or 15 miles if the Backbone Trail to Kanan Rd. is skipped. 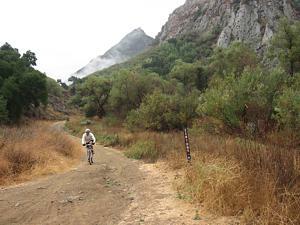 There will also be shorter easy rides in Malibu Creek State Park including the Grasslands Trail to De Anza Park. There will be plenty of opportunities for every level of rider to have a great ride in support of your local trail advocacy organization. You can view the route maps and details of the rides on our ride routes page. Of course, we’d hate to pass up the opportunity to have some cool demo bikes on hand, and so far we have gotten commitments from Trek, Specialized, Giant, and Bionicon who will have some of the newest technology on hand. We’re also very excited to announce that New Belgium Brewery will be serving samples! And of course there will be a raffle, with some really cool prizes including bikes, gear, and more. Visit our Fat Tire Fun(d)raiser 2011 web page for more information and to get registered. Hope to see you there! The annual IMBA Take a Kid Mountain Biking day, always the first Saturday in October, will be October 1st this year. 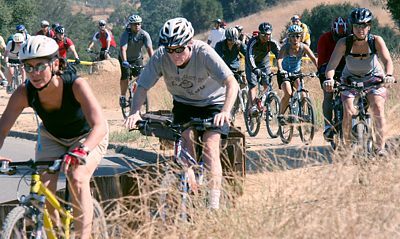 For details and photos of previous years' events, please view our Take a Kid Mountain Biking web page. 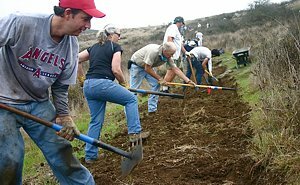 Trailwork days are being planned for October/November in the Angeles National Forest, but the dates have not yet been confirmed. We'll be posting the dates on our calendar as soon as they are confirmed. September 11: Verdugo Peak trails Thirty-two volunteers headed up Hostettor road (La Tuna Canyon) in the Verdugo Mountains. Eagle Scout candidate and St. Francis High School racer Steven Ayoob had chosen to work on the trails at Verdugo Peak for his Eagle Scout project. Verdugo Peak is the highest peak in the Verdugo Mountains. CORBA trail crew volunteer Steve Messser served as an advisor for the project, supplying CORBA’s tools and expertise. After a round of coffee, juice and donuts, the group held a moment of silence in memory of the victims of September 11, 2001. Steven gave instructions and organized the group before heading up to the peak and trailwork site. At the top Steve Messer gave a talk on safety, tool use and the objectives of the trailwork. The National Park Service has completed the purchase of another important land parcel along the route of the Backbone Trail, leaving just a scant mile or so still not open to the public. For more information, click here. Good sports photography isn’t easy. Many popular sports - football or motor racing, for example - give amateur photographers limited access. To make matters worse, getting close enough to the action for worthwhile shots can involve expensive long lenses that are beyond the financial reach of many photographers. Mountain biking is different. Whether it’s on a recreational level in beautiful surroundings or part of the race scene with pro-level riding, access is straightforward. A DSLR with standard zoom is all you need to get started, and the techniques for bike photography translate to other sports too. It’s a great way into sports shooting. Read the rest of this article at dpreview.com. 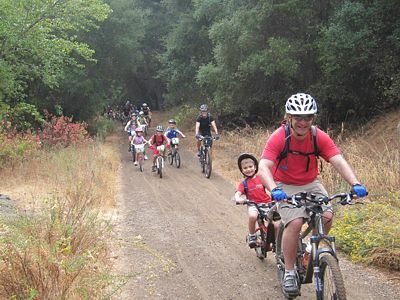 Next CORBA Kids Club ride will be Saturday October 1st, as part of the annual Take A Kid Mountain Biking Day at Malibu Creek State Park. See our Rides Calendar for details. Next Beginners ride will be Saturday October 8th. See our Rides Calendar for details.